Click-to-call, sometimes called click-to-talk or click-to-dial, is a way to let people connect with a company representative by phone while they’re browsing a website or in an app. Your website or app may be full of useful information, but sometimes, your customers really just want to talk with a real, live person. Perhaps they want to know more about your product or service before they make the decision to buy, or maybe they have a support issue and don’t want to wait around for email. Click-to-call creates an easy way for your customers to contact your sales and support teams right on your website. You may be wondering, “Do people really talk on the phone anymore?” The answer is, actually, yes! Studies have shown that 88% of website visitors are more likely to contact your company if you provide a click-to-call button. And if they’ve taken the initiative to talk to you, chances are greatly increased they’ll buy from you too. In 2017, Forrester Research, predicted consumers would spend more than $1.12 trillion through click-to-call mechanisms within the year. The numbers really do speak for themselves. Market research shows adding a click-to-call button can lead to a 200% increase in call-to-conversion rates. In addition to helping you increase sales and improve customer satisfaction, adding click-to-call functionality can help reduce negative impressions as well. In Google’s research of 3,000 mobile users, 47% said they were more likely to explore a company’s competitors if there wasn’t a way to directly call the company, and 27% reported they are less trusting of a company when there isn’t a way to connect by phone. A button, image, or text on the site or app lets the user enters a phone number and requests an immediate call back. While the call is being established, contextual information about the customer—such as their name, the page they’re currently visiting, and any other relevant information the API can access—is passed to the representative on the call. The customer doesn’t have to actually enter this information, the service knows it automatically. An HTTP request initiated by the web form initiates an outbound call to the user’s phone number and the user gets their callback right away. This process allows users to receive highly personalized customer service, with the easy click of a button. Many companies choose to offer their customers both text chat and phone connection options, and find that the customer’s device type affects their choice of channel. For example, Twilio customer iAdvise finds that 70% of their customers opt for text chat when connecting to their site on desktop, while 30% choose voice calls. However, when customers are on mobile devices the percentages are reversed, with 70% of users selecting click-to-call to connect via voice and 30% choosing text chat. Another way that businesses use click-to-call is for sales and support agents working in a CRM. Twilio offers an integrated dialer that lets reps automatically place outbound calls with just one click. For example, with Lightning Dialer in Salesforce, one click calls a customer and opens their entire contextual record. Reps can take notes seamlessly, automatically log calls, drop pre-recorded voicemails, power through call lists, and more. This ability to “click” the phone number without manually entering it saves time, reduces errors, and increases agent efficiency. 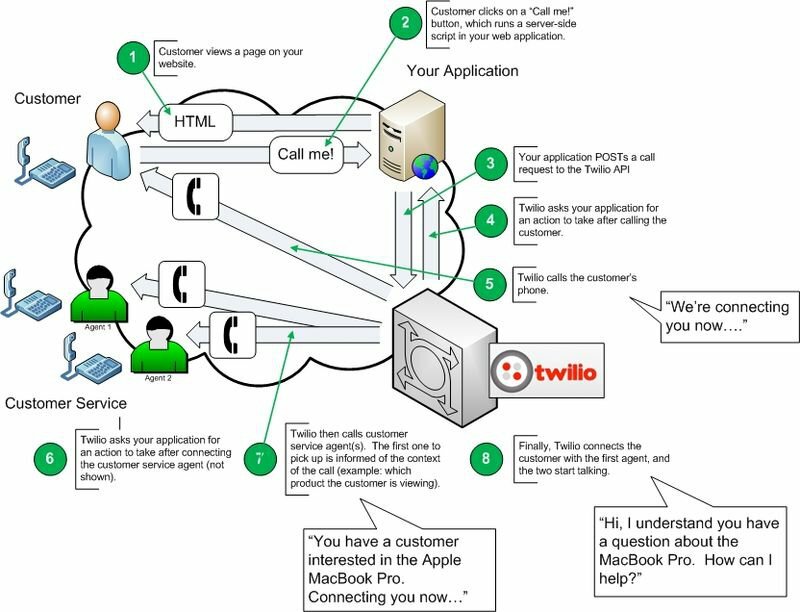 Adding click-to-call to your website with a Twilio SDK is fast and can be accomplished in a matter of minutes. It’s also affordable, with calls starting very cheaply per minute. And you always pay only for what you use—no monthly fees or sign-up costs.